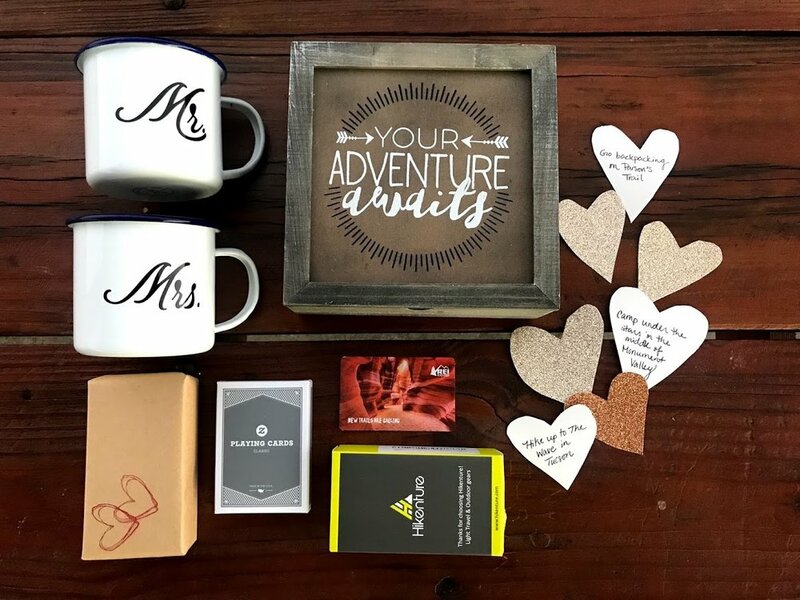 For the adventurous couple that is about to say “I do,” here’s what they need for their next adventure as husband and wife. I’ve always found a campfire is where some of the best memories are formed. It’s where stories are told, the day’s adventures are recapped and laughter into the early morning is held. It’s where the first cup of caffeine is warmed to start the day and moments of peace sit. For the couple who loves these moments around the fire as much as I do, personalized mugs can make their campfire moments even more special. For the mugs, I found a fantastic Etsy creator. Make sure the mugs you select have an enamel coating - they’ll last longer and be more durable around the fire. I chose to do classic Mr. & Mrs. mugs, and add a customized “To Infinity And Beyond” message to highlight their love (and their love of Disney!). Get a box of your choice (I opted for this one from Hobby Lobby) and fill it with a few of your favorite trip ideas. 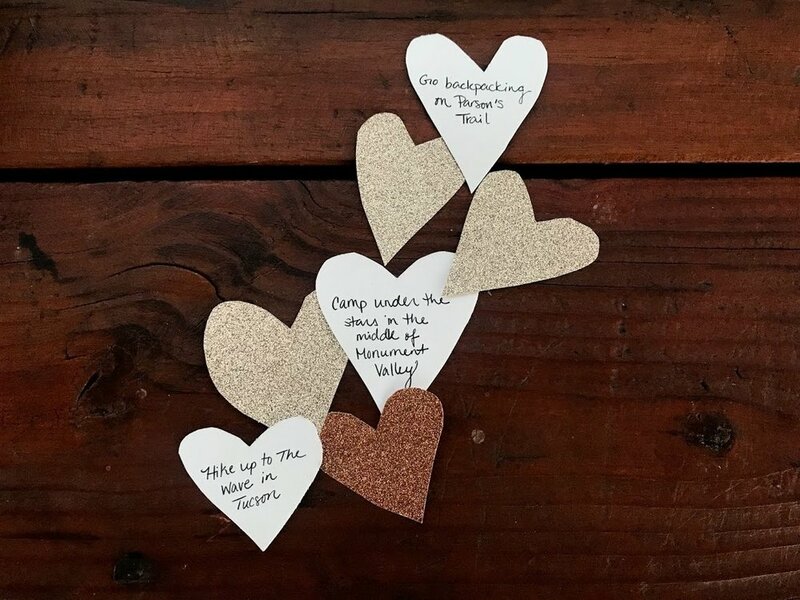 I grabbed glitter paper, cut out rustic hearts and wrote a different adventure - big and small - on each one. To help them pack up their bags, add in an REI giftcard too. One thing I love about camping is disconnecting and getting back to basics. And one of those basics is card games. To match the Disney theme of the mugs, I gave the couple custom playing cards with the date of their wedding and names. Now each time they play, they can remember their special day. Give the couple the one thing campers always need - utensils. Just like a campfire, great memories are made around good meals. I opted for these ones from Amazon and wrapped them in postal wrapping paper and added heart stamps to add to the theme of love. This gift came out to be about $100. 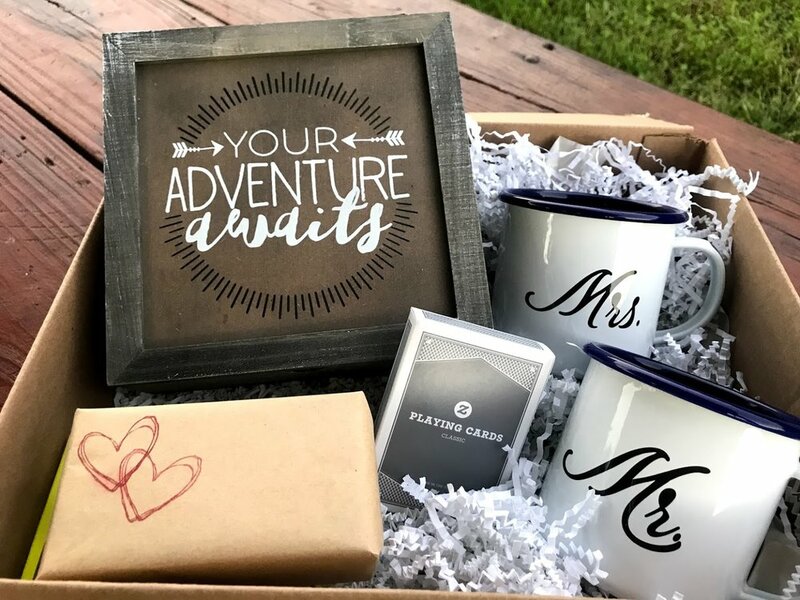 The personalization and unique set will make any couple excited for their next adventure as husband and wife, to infinity and beyond.